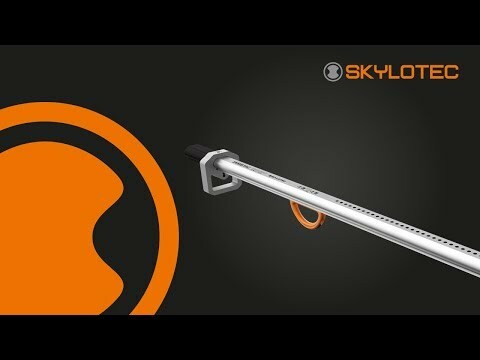 The SKYLOTEC CLAW Vertical Fall Arrest Sleeve is designed to fit a wide variety of solid core wire ropes (cables) and travel smoothly along the vertical system while providing fall arrest when needed. Features include: • German engineered to fit 3/8 inch (9.5 mm) and 5/16 inch (8 mm) solid core wire rope. • High quality lightweight stainless-steel construction. • Smooth travel up and down the vertical system. • Redundant safety features reduce the risk of improper installation. • Replaceable shock absorbing pack. • Anti-gravity locking system. • Two-hand operation for increased safety that prevents an unintentional opening of the sleeve • Shackle and swivel carabiner for a maximum ease of use and freedom of movement. • Combinable with all types of chest D-Rings. • ANSI A14.3-08, Meet CSA Z259.2.5-17 and OSHA requirements. • Independently tested on the DBI Lad-Saf vertical climbing system to the above standards.